You’ll instantly receive a download code, which you’ll redeem directly on your console or online through your console’s website. This code will be stored in Your Games Library on Amazon if you need to access it later. Lead Yoshi on a brand new Nintendo Switch adventure that will turn everything you've come to expect from side-scrolling games upside down! Explore a diorama-like world made of stuff like boxes and paper cups, where each side-scrolling stage has the traditional front side as well as a flip side with different views and surprises. Many unusual obstacles litter the landscape, and a well-placed egg could open up new pathways! Explore every nook and cranny to track down hidden collectibles throughout the stage as Yoshi heads to the goal. You can even join up with a friend in two-player co-operative action by passing them a Joy-Con controller! Buy this product and get 90 days free of Amazon Music Unlimited After your purchase, you will receive an email with further information of how to enjoy 90 days of free Amazon Music Unlimited. Terms and Conditions apply. Note: Currently, this item is available only to customers located in the United Kingdom. 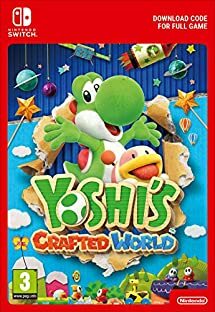 Lead Yoshi on a brand new Nintendo Switch adventure that will turn everything you’ve come to expect from side-scrolling games upside down!